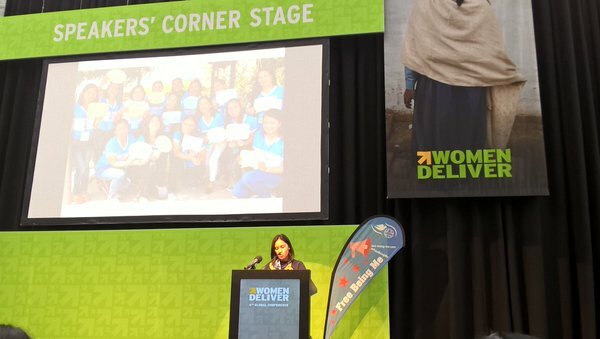 Last week WAGGGS and Dove came together to speak about Free Being Me and the importance of body confidence at the Women Deliver conference- the world’s largest global conference on the health, rights, and well-being of girls and women. Angeli Siladan from Girl Scouts of the Philippines spoke about the pressures girls and women face and the positive impact Free Being Me has had in her country. “Before I came to Copenhagen, I met up with some friends who I hadn’t seen for a while. Instead of asking me how I was, they immediately asked that reunion question, “Why are you so dark?” Of course, I know it was my skin color. As if my skin color is the most important story that’s happening in my life. In the Philippines, you will be surprised with the obsession of girls and women with whitening products. The gigantic billboards along major highways exhibits this. And I tell you, for a young girl who has lived her whole life in the Philippines, having dark colored skin is devastating. It is associated with being poor, ugly, lower class. This has cost girls their education, and right now because of social media, we have cyber bullying. That is how important body image is for girls not only in the Philippines but around the world. I’m Angeli and I’ve been a Girl Scout since I was 6 years old. I was 14 when I first attended a self-esteem session with Dove in a national Girl Scout camp. Because of that session, I was able to confront insecurities and fears in my own body. The confidence that I gained helped me find that capacity to lead young people in my community as a government official. The Free Being Me programme became a transformation of that experience and this time we have been training adults and young women to share this to other girls in their own communities. Using non-formal education, Free Being Me teaches girls to value their bodies, stand up to society’s pressure to conform to a narrow idea of beauty, and support others to be more body confident. Having already reached 2.74 million young people in over 100 countries worldwide, Free Being Me will change the lives of 3.5 million girls and boys by the end of 2016. In the Philippines at least 600,000 girls will be reached through Free Being Me over the next three years.